The last two weeks have been hard on Twitter. Its shares have sunk to their lowest number in three months. But this is not over yet, as today more shares of Twitter have unlocked, which allows its shareholders who have long held stock in the social giant to sell theirs finally. So what happens if you have invested in a company and waiting for the return for quite some time? The answer is chaos, as most of the people who just had their shares unlocked are selling them at a rapid pace. They have caused the share price to drop 11%. Twitter is currently trading around the $31.85 mark; it is slowly decreasing its value down from the high of $36.10 which it hit this morning. One thing to make note of here is that when the Facebook shares unlocked the value of Facebook rose more than 10%, which speaks to the credibility of Facebook. In case of Twitter, the opposite is happening. Today the total Twitter shares traded are above 63 million shares which is way higher than the normal 13 million shares average. Twitter has had to struggle with its share price in the past when stale user growth forced its shares to drop to $45 from $74 high. Still the share price is greater than the price at the time of Twitter’s IPO which is a good sign and shows the investor trust in the company. Although it’s a bit unusual to see shares dropping like that. Twitter has recently launched its new profile UI and has planned to bring video ads to user twitter feeds but still the price dropped. According to Google Finance, Twitter has about 569 million shares. The founders have agreed to not sell their shares. 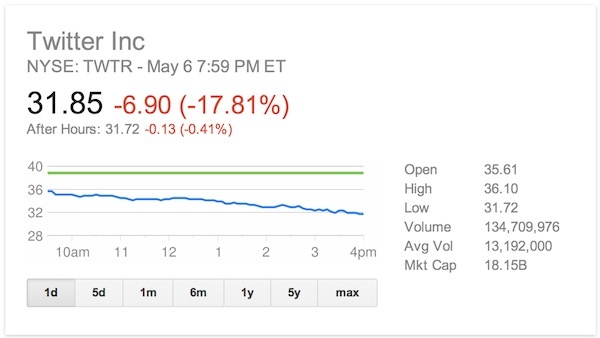 So still only a fraction of the twitter shares have been traded. Twitter should learn from this, and control the insider trading, if it wants to play in the big leagues.